Colonel Harland Sanders, who was a successful American businessman and founder of famous KFC fast-food chain. After facing series of failures and rejections in his life, he proved it right that “The one who tries, never fails”. 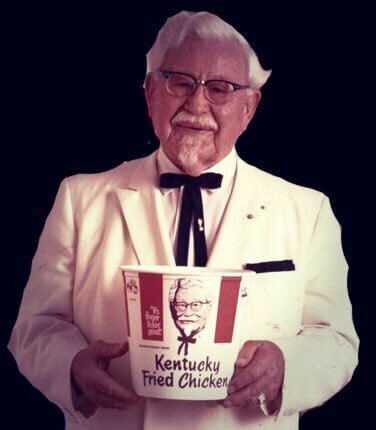 Colonel Sanders was born in 1980, at a farm in Henryville, Indiana. He lost his father at very small age of 5 years. Death of his father left his family in financial trouble. His mother started working in factory which kept her away from home. Therefore, colonel took responsibility of his younger siblings and started cooking for them. At age of 7, he became expert in cooking & at age of 10, he started working in a farm and used to paint horse carriage. At age of 12, his mother got married again and they moved to Greenfield, to live with his step father. But within a year Colonel Sanders was sent back to Clark County, because of his bitter relation with his stepfather. Sanders started working in a farm for just $10- $15 per month. He couldn’t balance between his work and school. So he got dropped out of school at age of sixteen. He also worked as conductor in a streetcar company. At age of 17, Colonel Sanders got fired from 4 jobs. In 1906, Sanders lied about his age and joined US Army and got honourably discharged in 1907. Later he moved to Alabama, where he worked as helper of blacksmith, ash pans cleaner of trains and fireman. In 1908, the businessman got married and had 3 children with his wife. His number of failures and rejections from work, troubled his marriage and his wife left him with 3 kids. One of his son died at age of 20, which left Sanders in depression. Sanders studied law by correspondence and practiced for 3 years. But a courtroom brawl with his own client ended his legal career. After that he worked as seller of life insurance, which again couldn’t last long and he got fired for insubordination. In 1920, he became minority shareholder of a boat company and got appointed as company secretary, but he resigned within a year. Later, he established a manufacturing company, which proved to be an another failure. Colonel Sanders started working in a gas station. For extra income he started cooking meals for travellers, who used to stop at gas station. His cooking skills brought him reputation of good cook. After some time, he opened his first restaurant near service station named ‘The Sanders Court And Cafe’. Soon, he bought a motel in order to expand his business. But his motel and restaurant, both burned into ashes. But he didn’t run away from battlefield and again rebuilt his motel. He sucessfully operated his motel untill 1940. But because of World War II his restaurant started to fail. In 1947, he divorced his first wife and got married to Claudia in 1949. He then started running cafeterias for government. At age of 65, Sanders got retired. On first day of retirement, he got cheque of $105 from government. This small amount was just not enough to survive. He decided to commit suicide. He sat under a tree to write his suicide note and will. While writing, he realised that there is so much he could do. He decided to give it a try. The businessman took a loan of $87 to buy a fryer and ingredients of his great recipe. He tried to sell his unique fried chicken door to door asking the owner of restaurants to let him cook for their employees and test his chicken recipe. Many times Sanders and his wife slept in a car and eat begged meals. He travelled across the country to frenchise his fried chicken recipe. His recipe got rejected by 1009 restaurants. This much rejection is enough to break anybody’s spirit but he didn’t give up and kept putting his efforts and finally 1010th restaurant called Salt lake City, which was operated by Colonel’s friend named Pete Harman, accepted his offer and frenchised his secret recipe which was blend of 11 herbs and spices. Thanks to Sanders chicken recipe, sale of Pete’s restaurant increased by 75%. Pete Harman helped Sanders develop his recipe franchising business and came up with name “Kentucky Fried Chicken”. KFC’s motto “it’s finger lickin good” was also coined by Pete. Soon, KFC recipe became a huge hit and many restaurants signed franchise agreement with Harland Sanders. After years of hard work and failure, Sanders got taste of huge success. He had franchised more than 600 outlets by 1964. At age of 73, Sanders sold most Kentucky Fried Chicken (KFC) for 2 million dollars retaining some part with himself. Sanders remained the face of company even after selling it, he used to travel across the world shooting commercials for company. He used to make surprise visit to the KFC restaurants to check the quality of food. In 1979, Sanders sued Heublein Inc. for misuse of his image to sell their products. He also donated much of his income to Salvation Army. The king of Fried Chicken recipe died in 1980 and left the world to enjoy the best fried chicken of the world. Today, there are 20,500 outlets in 131 countries and territories all over the world. And KFC is the most popular chicken restaurant chain in the world. KFC was ranked 4th in most valuable fast food brands worldwide in 2018. The businessman started his new life at the age of 65, when most people enjoy their retired life, he worked harder than ever. Although he had hard time because of failures throughout his life but he never gave up on his dreams. He got success at old age because there is no age to dream big and achieve it.